D1566 emerged from its birthplace of Crewe Locomotive Works in March 1964. The loco was immediately despatched to Darnall shed, Sheffield. Only a few weeks later, the machine moved on to Immingham depot, followed shortly afterwards to Finsbury Park shed. At this time the loco was being utilised on services up and down the East Coast Main Line. In early 1965 the loco was to be found allocated to March depot, working freight trips to and from the busy yards in the area. Norwich shed then took the machine under its wing, regularly turning her out on passenger jobs to London Liverpool Street. By the late 1960s the loco had returned to its original Sheffield home, although shortly after the turn of the new decade had been despatched back to Immingham. By the beginning of 1973 D1566 was sent to pastures new, finding itself now allocated to the then B.R. 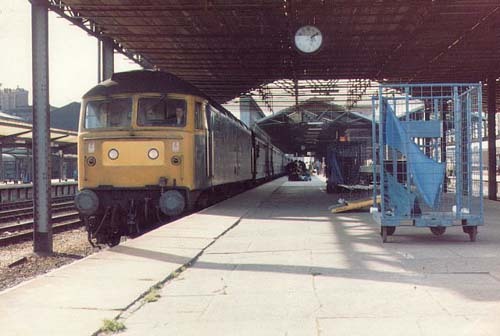 Stoke Division, before being transferred to the depot where it was to spend most of its working life, Crewe Diesel Depot. It was here that the loco gained its new TOPS identity of 47449, denoting its fitment of Electric Train Heating equipment. The locomotive was to be found working all over the country on out and back diagrams from this depot. Forays down the North Wales Coast being especially common in the 1980s. Sectorisation loomed, and 47449 was to find itself allocated to the freight sector at the end of its stay at Crewe, and by 1990 the loco had returned to Sheffield, although this time Tinsley depot. It was at this time the loco acquired its unofficial name of ‘ORIBI’, in true Tinsley painted on style. Now officially a Railfreight Distribution machine, it was only a matter of time before another move beckoned, this time to Old Oak Common under the banner of Network South East. At this time the loco could be found hammering between Paddington and Oxford, covering diagrams that the then quickly disappearing class 50s had left to cover. A short move across London to Stratford followed in early 1993, and it was in the May of this year the loco was to be withdrawn from traffic. 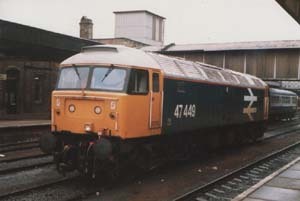 47449 was then purchased from British Rail by Pete Waterman and became a Rail Charter Services loco.The machine at this time was being utilised at Tyseley for driver training purposes. The locomotive was purchased for preservation by the Llangollen Diesel Group in 1996, and was displayed at the Crewe electric depot open day of the same year. Occasional use at Llangollen followed, seeing use at Diesel Gala’s, and also, once we re-commissioned the ETH equipment, Santa Special traffic in the cold Winter months. The loco was to find itself back in the limelight in 2001, when it was hired to Alstom Traincare at Chester. The reason for this was to enable staff to be trained on emergency rescue by loco techniques involving the new class 175 units. 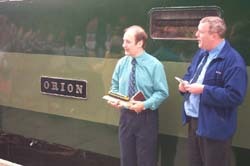 The weather worn large logo livery was kept on the loco until March 2002, when the loco was outshopped at Llangollen in original two-tone green livery, with full yellow ends and given its original D1566 identity. 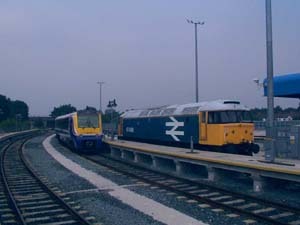 We decided to name the loco after long scrapped Western Region sister loco 47083, ORION, in the summer of 2002. 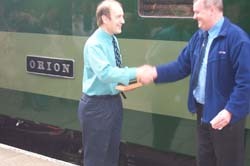 A full naming ceremony was arranged at Llangollen and was carried out by ‘Rail Express’ magazine editor Murray Brown, who was presented with an 00 gauge replica of the locomotive as a token of thanks from the group for ‘doing the honours’. 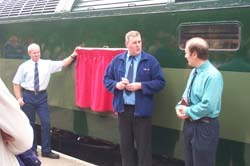 The unveiling of D1566s nameplate, performed by Murray Brown. With grateful thanks to Martin Corbett, who wrote this history, compiled the photos and was a major part of the team who saved D1566 and returned her to service at Llangollen.